It was the most daring of Hellenes who traversed more than 5000 miles from mainland Hellas to join their Ionian brethren (former Persian exiles) in colonizing Baktria. Of those, the bravest became expert horsemen sworn to defend the Basileus of Baktria or members of his family with their lives. Going in battle with the long thrusting xyston spear as a primary weapon and a kopis short slashing sword for melee. They wore a metal cuirass and a Boetian helmet. For lower body protection they wore a lammelar armour for the thighs and leg protectors, the perikneimides. As a unique characteristic, they carried a palm branch on their back, possibly to distinguish themselves from the rest of the Hetairoi cavalry. Their exemplary bravery and dedication was such that they were immortalized on most of the coins their Kings minted. Not as armored as the Hetairoi Kataphraktoi who succeeded them, they were none the less admired and envied throughout the Hellenic world! Historically, " The Hellenes who caused Baktria to revolt grew so powerful on account of the fertility of the country that they became masters, not only of Ariana, but also of India, as Apollodoros of Artemita says: and more tribes were subdued by them than by Alexandros...." and "they extended their empire even as far as the Seres (Chinese) and the Phryni" Strabo (11.11.1). Baktrian Hellenic prowess and zeal, coupled with horse mastery and the locals' willing assimilation into the Baktrian state led to the territorial expansion into what is now known as central asia. Until 250 BC, Seleukid empire was Baktria's overlord. Independence was gradual, yet assured. It has been suggested that Seleukid mismanagement of Baktrian affairs and fear of Nomadic raids turned local Hellenes into fervent independence supporters. Diodotos I and II strenghthened the state by allying with the emerging Parthians against Seleukos II. Eythydemus seized the throne after that, and then the expansion to the steppe began. In every step of the way he was escorted by his bravest and most faithful troops, the Baktrian Early Bodyguards. To the north, Euthydemos also ruled Sogdiana and Ferghana, and there are indications that from Alexandreia-Eschate the Baktrian Hellenes may have led expeditions as far as Kashgar and Urumqi in Chinese Turkestan, leading to the first known contacts between China and the West around 220 BCE. As an overlord of Ferghana, Baktria, Sogdiana and Arachosia, Euthydemos faced the early Cataphracts of the Steppes and thus evolved the design to what became Kataphraktoi and their elite, Hetairoi Kataprhaktoi.The Baktrian Early Bodyguards built on the Hetairoi tradition, wearing the same Boiotian helmet, but wore heavier clothes mostly to keep warm from the cold of the steppes. On top of that a metal cuirass was worn. Some had even started armoring their mounts. Even if the much heavier Hetairoi Kataphraktoi superceded them in guarding the Kingdom's Royalty, their position in the battle line remained unchallenged as they were much more mobile and could easily retreat and regroup than Kataphraktoi. 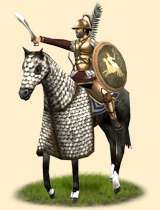 They fought in the heavier cavalry flanks guarding them from more agile opponents, much like Hypaspistai and Thureophoroi guarded the pike armed phalanxes in the infantry.